In conjuction with my current show, Embracing Mistakes at the Dairy Center for the Arts, I am doing a thread drawing + collage workshop at the Dairy Center on Thursday, March 22nd from 6:00 - 8:00. Come learn about my process and work in this fun workshop environment! There will be some light apps and wine included in the price of a ticket, which is $25. You may call the Dairy Arts Center or go online to reserve tickets. The link is below or you can go to The Dairy Arts Center website and find it under tickets under the date of March 22nd. Spots are limited, so book soon! Artists in the 21st century have to be shrewd to stand out. They often employ multiple disciplines to produce notable work. They challenge the world around them and explore unusual notions. This collection exemplifies artists using any means necessary to express themselves. Subject, medium and/or technique are pushed in innovative ways and combinations. Space is redefined, color bends and flows, marks become obsessive, organic life is raw and distorted. These visual entrepreneurs transcend the norm by provoking innovation and wonder. Participating Artists: The Women's Art League, Fred Annes, Drew Austin, Shannon Belardi, Sarah Bozaan, Katie Caron, Diane Cionni, Trey Duvall, Jessica Forrestal, Brian Fouhy, June Glasson, Joshua Goss, Erica Green, Clay Hawkley, Patricia Howard, Helios Lucida & Wendy Basmajian, Suchitra Mattai, Collin Richard, Fazilat Soukhakian, Jodi Stuart, Louis Trujillo, & Kaitlyn Tucek. About the curator: Jessica Kooiman Parker is the Curator of the Firehouse Art Center in Longmont, CO. She has a BFA from the University of WI-Stout. In 2016 she exhibited over 170 local and national artists in 18 exhibitions. She strives to bring thought provoking and process-based work to new audiences. Under her direction the Firehouse has won numerous awards and emerged as the leading contemporary art space in Longmont. This exhibition takes a look at three artists working with various mediums (thread, porcelain and metal) to create organic, geometric forms. Their individual configurations develop a language of jarred and broken spaces, tangled textures and precise angles. Together the work invites the viewer to explore tiny, delicate and harsh constructions of life. The free flowing, dripping thread drawings of Erica Green, spread across the page like cells building upon themselves. She references mistakes, the unknown and forgotten spaces. The smooth, refined work of Liz Quan forms an inciting world of texture, weight and color. Strange shapes create a narrative of play and mystery. In contrast to Quan and Green, Jodie Roth Cooper creates sharp mechanical bodies that climb the wall as if, at any moment, they could forever meld into a structural component of the building itself. The Arvada Center is proud to present Art of the State 2016. This juried exhibition showcases the quality, depth, and diversity of Colorado artists and is the follow-up to the critically acclaimed Art of the State: A Juried Exhibition of Colorado held in 2013. In its second iteration, Art of the State 2016 garnered 1,434 entries from 511 artists. The call for entry was open to all Colorado artists in all media. Jurors selected 148 works by 124 Colorado artists, both emerging and established. All three of the Arvada Center’s galleries, over 10,000 square feet, will be devoted to this celebration of art in Colorado. Opening Reception: Thursday, January 21, 6:00 – 9:00 p.m.
Saturday, February 6, 2016 11:00 a.m., Thursday, February 25, 2016 6:30 p.m., Saturday, March 19, 2016 11:00 a.m.
Find my work at the LUX Center for the Arts in Lincoln, NE. Show is up until Dec. 24th. Come visit my home studio and gallery! I'm excited to announce that I will be a resident artist this summer at the LUX Center for the arts in Lincoln , NE. I'm looking forward to the opportunity to work at this wonderful art center and studio! I have a drawing in a show at Core Art Space in Denver. This show was curated by Rebecca Vaughan to showcase work that was predominantly black and white. Show will be up for the month of May. Opening is on May 8th from 6-9 pm. I am excited to announce that I am part of a two-person exhibit at The Colorado Conservatory of Dance in Broomfield, Colorado. The show, titled Works on Paper, will be up from March 1 until April 30, 2015. 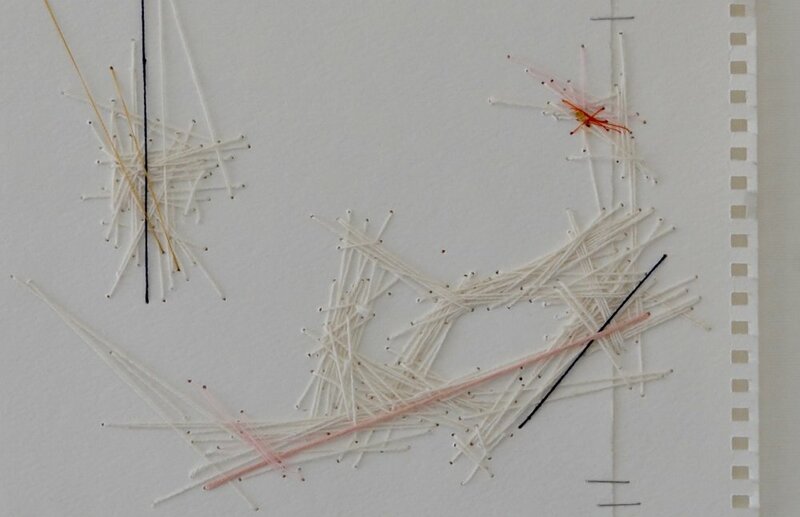 I am showing a collection of small thread drawings on paper. I've titled my exhibit fragments. You can view the work online under the drawing tab or in person. Please visit www.ccdance.org for hours. All works are for sale and a portion of the proceeds will benefit The Colorado Conservatory of Dance. Please contact me for sales information in the 'contact' tab or at ericaranee@gmail.com.